Editor’s Note: As crochet stitches differ from one part of the world to another (and also from one era to another), I have included a sidebar of the terms used. This is the explanation of abbreviations included in the original booklet so, hopefully, anyone with a working knowledge of crochet should be able to follow it. You can also download the entire booklet from the Antique Pattern Library; look for Richardson’s Crochet Bedspreads, Book 6, available under Creative Commons License 2.5. Although I haven’t tried this pattern myself yet, I’d like to do so, because I think it would look very striking over top of a colored coverlet or blanket. If anyone tries this pattern and would like to share hints or pictures, please let me know through the comments box below. Materials: Richardson’s White R. M. C. Art 65 Crochet Cotton, No. 3 or No. 5. Steel Crochet Hook No. 8. Motif: Ch. 16 Sts., join to form a ring, Ch. 7, 1 D. in each of 5 Sts., *Ch. 5, 1 D. in same Sts. where last D was made in, 1 D. in each of the next 5 Sts., repeat from * twice, Ch. 5, 1 D, in same St. with last D., 1 D. in each of 3 Sts., join with a Sl. St. to third Ch. St. on Ch. 7 first made in round. Second Round: 1 Sl. St. in each of 2 Ch. Sts., Ch. 8, 1 D. in same Ch. St., *Ch. 3, skip 1 D., 1 D. in each of the next 3 D., Ch. 3, 1 D., Ch. 5, 1 D. in third Ch. St. on Ch. 5, repeat from *ending round, Ch. 3, skip 1 D., 1 D. in each of 3D., Ch. 3, join with Sl. St. to third Ch. St. on Ch. 8. Ch. St. – Chain StitchSl. St. – Slip Stitch. Insert hook in St., over, draw through St., and loop in hook. S. – Single Crochet. Insert hook in Ch. or St., draw the thread through, over, draw through both loops on hook. D. – Double Crochet. Over, insert hook in Ch. or St., draw a loop through, over, draw through 2 loops, over, draw through 2 loops. H. D. – Half Double. The same as a double, only take 1 St. over hook, insert in Ch. and draw through all three loops. Tr. – Treble Crochet. Over twice, insert hook in Ch. or St., draw a loop through, over, draw through 2 loops, over, draw through 2 loops, over, draw through 2 loops. Third Round: 1 Sl. St. in each of 2 Ch. Sts., Ch. 5. 1 D., Ch. 2, 1 D. in last Ch. St., *repeat 1 D., Ch. 2, 1 D. in third Ch. St., 4 times, 1 D., Ch. 2., 1 D., Ch. 2, 1 D. in the third of the 5 Ch. Sts. at corner, repeat from * ending round, repeat 1 D., Ch. 2, 1 D. in third Ch. St., 4 times, join with a Sl. St. to third Ch. St. first made in round. Fourth Round: Ch. 4, *1 D., Ch. 2, 1 D. in center D. at corner of square, repeat 1 D., Ch. 2, 1 D. in third Ch. St., 5 times, repeat from * ending round, repeat 1 D., Ch. 2, 1 D. in third Ch. St., 4 times, 1 D. in third Ch. St., Ch. 2, join with a Sl. St. to top St. on Ch. 4 first made in round. Fifth Round: 1 Sl. St. in each of 2 Sts. Ch. 8, *1 Tr. in center of D. at corner of square, Ch. 5, 1 D. in Space, repat Ch. 3, 1 D. in next space, 6 times, Ch. 5, repeat from * ending round, by joining the last Ch. 3 to third Ch. St. on Ch. 8. Sixth Round: Ch. 5, skip 1 St., 1 D. in next St., Ch. 1, skip 1 St., 1 D. in next St., *Ch. 1, 1 D., Ch. 2, 1 D. in Tr., repeat Ch. 1, skip 1 St., 1 D., in next St., 17 times, repeat from * ending round, 1 D., Ch. 2, 1 D., in the Tr., repeat Ch. 1, skip 1 St., 1 D. in next St. 14 times, Ch. 1, join with a Sl. St. to fourth Ch. St. on Ch. 5. Seventh Round: 1 Sl. St. in each of 2 St., Ch. 8, 1 Sl. St. in the fourth Ch. St. from hook, Ch. 1, 1 D. in joining St. of round, skip 1 D., 1 D. on next D., Ch. 5, 1 Sl. St. in first Ch. St., Ch. 1, 1 D. with D., *Ch. 7, turn, skip 1 St., 1 S., 1 H. D., 4 D. on the 7 Ch. Sts., repeat 1 D. on next D., Ch. 5, Sl. St. in first Ch. St., Ch. 1, 1 D. with D., skip 1 D., 10 times, repeat from * ending round (repeat), 1 D. on next D, Ch. 4, 1 Sl. St. in first Ch. St., Ch. 1, 1 D. with D., skip 1 D., 8 times, join with a Sl. St., Ch. 1, break off thread, fasten, this completes one motif. Seventh Round to join second Motif: 1 Sl. St. in each of 2 Sts., Ch. 8, 1 Sl. St. in the fifth Ch. St. from hook, Ch. 1, 1 D. in joining St. of round, skip 1 D., 1 D. in next D., Ch. 5, 1 Sl. St. in first Ch. St., Ch. 1, 1 D. with D., *Ch. 7, join with a Sl. St. to corresponding point of petal on other Motif, Ch. 1, 1 S. 1 H. D., 4 D. on the 7 Ch. Sts., repeat 1 D. on next D. on Motif, Ch. 5, slip loop from hook, insert hook in corresponding Ch. 4 on other Motif, slip loop back on hook again, and draw through St., 1 Sl. St. in first Ch. St. on Ch. 5., Ch. 1, D. with D. made on Motif, 10 times, Ch. 7, join with a Sl. St. to corresponding point of petal on Motif, Ch. 1, 1 S., 1 H. D., 4 D. on the 7 Sts., repeat 1 D. on next D. on Motif, Ch. 5, 1 Sl. St. in first Ch. St., Ch. 1, 1 D. in St. with D., 10 times, repeat from *in seventh round in first Motif to ending of round. 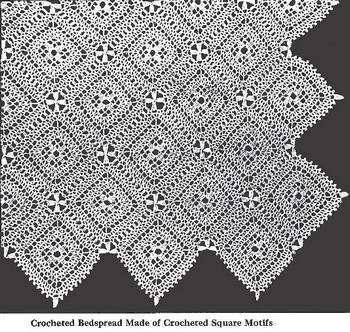 Make as many Motifs, joining same together, as the desired size for Bedspread.